Fiona Apple has covered Willy Wonka‘s “Pure Imagination” in collaboration with Mexican fast food chain Chipotle in a campaign against factory farming. 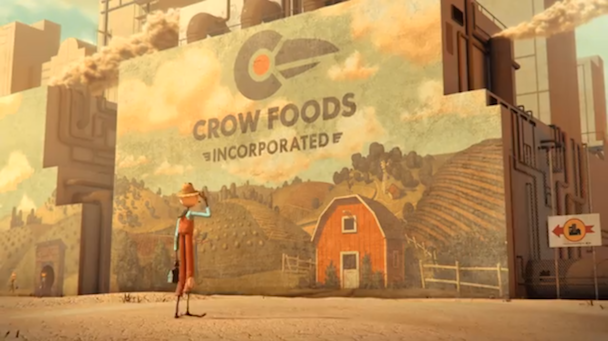 Apple, who is a known vegan, soundtracks an animated clip of a world where “scarecrows have been displaced from their traditional role of protecting food, and are now servants to the crows and their evil plans to dominate the food system. Dreaming of something better, a lone scarecrow sets out to provide an alternative to the unsustainable processed food from the factory.” There is also a game based on the video that you can check out here. Chipotle has been known to mix music and food politics, having enlisted Karen O. and Willie Nelson (covering Coldplay!) for previous campaigns. Check their latest below.